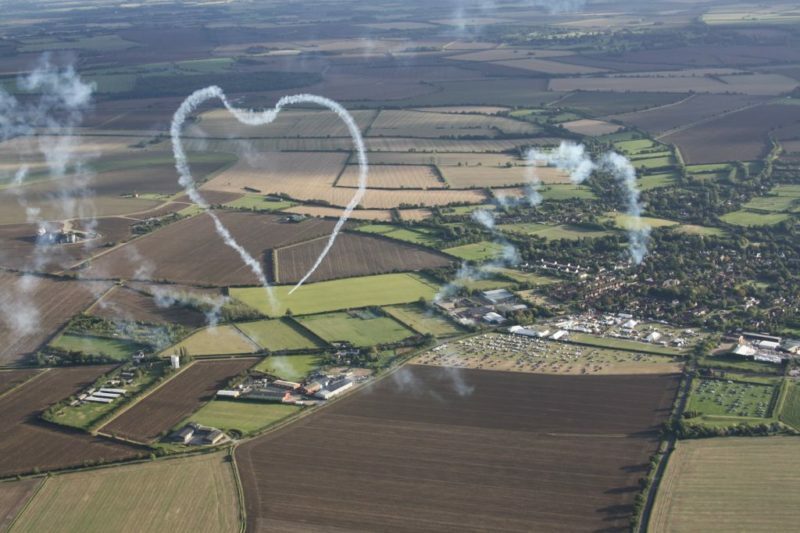 On your special day eternalise your love in the sky, experience the most memorable wedding ever, by booking your very own unique air show. This never-to-be forgotten air show will enthral your guests and leave them talking about the experience and your special day for a long time to come. The perfect alternative to fireworks and magicians that everyone has seen before ! See what others have said in their testimonials. Due to their vast experience, Mark and his colleagues are specifically authorised by the Civil Aviation Authority to fly lower (down to 30 feet) and closer to you than aviation law normally permits. Whether the display is a single aircraft or formation attending a private function or part of a large public air show our pilots ensure you have the best viewing for a spectacular flying display. Our team of aerobatic pilots guarantee to give you a truly unforgettable flying display. They will fly daring but graceful figures, breath taking, gravity defying manoeuvres including tumbles, loops, swoops flicks and rolls. Environmentally friendly smoke (baby oil) will trail the aeroplane emphasising the flight path, giving a spectacular aerobatic display that will both surprise and delight your guests. The air shows usually begins and ends with a stunning “love in the air” heart but we can discuss specific requirements, such as numbers for birthdays and tailor make the performance to your specific event. The skill and vast experience of our pilots ensures they will perform a well balanced display for you and your audience and can do so in a wide variety of weather conditions. Each air show lasts approximately ten minutes, formation displays longer, and of course each is the ultimate unique spectacle to entertain your guests. We can also guarantee getting to your venue within a minute of the agreed time, allowing us to plan your air show effortlessly around the whole event. Approximately the same cost but much more impressive than fireworks ! BTW, I can carry fireworks on the wings for extra wow factor. I can take payment via PayPal to help with stage payments if required.